Check out these four helpful tips for fall leaf removal. There are so many great things about fall, but one negative aspect is the chore of raking leaves in your yard. While leaf removal is likely on the bottom of your list of favorite fall activities, it is necessary to keep your grass healthy throughout the season. Continue reading for a few helpful leaf removal tips that will make the process more efficient. Some people like to start raking as soon as leaves start falling from the trees, while others like to wait until a significant amount of leaves are on the ground. 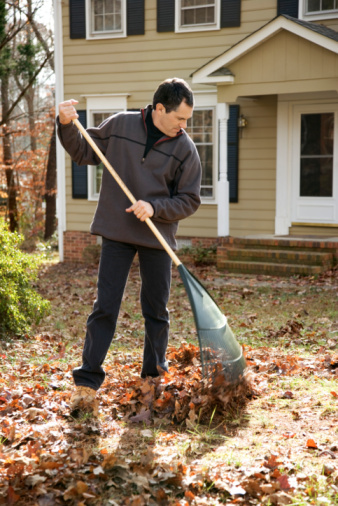 However, the best time to start raking is actually when about 30 percent of leaves have fallen off the trees. This method allows you to get a head start before too many leaves pile up, but you still have a decent amount of work to do. After the first cleanup of the fall season, you may need to remove leaves once every one or two weeks- depending on your yard size and how many trees are on your property. Have you ever tried to remove leaves when they are wet? It is not just a terrible time; it is also not at all efficient. Wet leaves are much heavier and harder to rake and bag, and it can take twice the amount of time it would normally take to complete the chore. Also, raking when the ground is wet can tear your lawn or garden beds, so it is best to take a few days off and let your lawn dry before attempting leaf removal. When removing leaves, the right tools make all the difference! A good, quality rake may be a little expensive, but it is worth it in the long run. Cheap rakes can break and make your job harder, and you will just end up spending more money to replace them. A leaf blower is also a good investment, especially for homeowners will large lawns. If you are worried about where to plug a leaf blower in, don’t worry- today’s battery-powered leaf blowers are cordless, lightweight, and will keep a charge for long periods of time. The main question of leaf removal is where to put all those leaves once you remove them from your yard. A great solution is to start a compost pile, as a large pile of leaves is one of the best ways to start. Leaves are full of nutrients that help other plants grow, such as grass trimmings, food scraps, and more. This entry was posted on Thursday, October 11th, 2018 at 3:56 pm. Both comments and pings are currently closed.